Zippy Shell offers safe and convenient storage units to Raleigh and its surrounding area. Our licensed self storage units can park legally on the street, docks, and alley ways. We look to provide unique local or long distance moving services that adjusts to your needs. We deliver the portable storage unit to your home. You then pack up your belonging, and we’ll pick up and store or deliver everything for you. 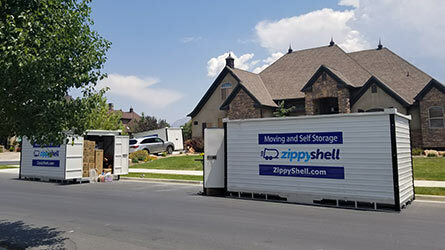 When the Zippy Shell storage unit is delivered to a customer’s driveway, they need to have at least 30′ in length and 9′ in width. The reason is that when you extend the ramp from the storage unit, it adds more overall length required. Using these dimensions should keep the storage unit off the sidewalk and the street. Keep in mind that there is a turning radius when pulling into the driveway or parking spot. Our affordable rates are generally around 20%-40% lower than our competitors. Give us a call today to receive a free quote. Learn How to Give Back to the Raleigh/Durham Community Today! Zippy Shell proudly supports our servicemen and women. We offer discounts on all military moves (Army moves, Navy moves, Air Force moves etc.!) Zippy Shell is a certified military mover for all branches of the armed services. We make your PPM easy and affordable by providing the best DITY moving and storage containers. When you call for a quote, tell the representative you are in the military to receive the best deal! Zippy Shell of North Carolina Serves: Brentwood, Cary, Chapel Hill, Crabtree Valley, Durant Chase, Durham, Durston, Falls Glen, Five Points, Forest Hills, Holly Springs, North Hills, Raleigh, Trinity Woods, Wake Forest, Fayetteville, and Garner areas. $30 Off storage each month!